A delegation of Friends of Israel Sci-Tech Network from the USA came recently for a two-day visit in Israel, in order to examine the latest developments in the Israel Sci-Tech Network, and the upcoming strategic challenges facing the Israeli education system. During this visit, the delegation visited four of the network’s schools, as well as the Israel Sci-Tech Network’s R&D Center, and the OpenValley Entrepreneurship Accelerator which operates as a partner of the Israel Sci-Tech Network. The visitors looked at issues such as: what’s next for STEM education, fostering entrepreneurship among students, training orthodox religious women towards integration in the job market, preparing vocational students for work in the 21st century’s aviation industry and the air force, and ways in which schools can lead social change. 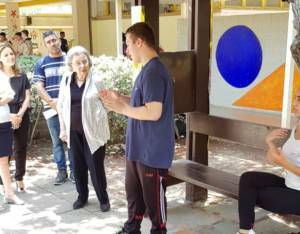 In Sci-Tech Afridar Ronson High School in Ashkelon, the visitors observed the application of the ISTEAM programme in the school, and met students who demonstrated projects developed along the lines of this model. 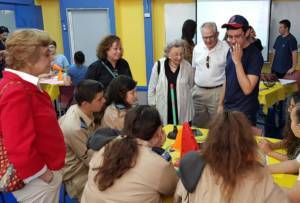 The ISTEAM programme, led by the Israel Sci-Tech Network’s R&D Center, has been running in its pilot stage for two years now, reaching eight of the network’s schools so far. This programme aims to encourage entrepreneurship among students, based on a multidisciplinary approach combining innovation, science and technology, engineering, art, and math. The programme utilizes study in small groups, which work independently in various learning spaces: the class, science labs, and the school yard. The teacher’s role is mainly facilitation and consultation, with hardly any frontal tuition taking place. This school is in its first year of the programme, involving three 10th-grade classes. Two of its students taking the entrepreneurship course have already made it with their own original idea – an alert system to prevent parents from forgetting babies in cars – to the final stage of the 2017 Made in Israel Young Entrepreneurs Contest. Their project was displayed at an exhibition in Herzliya, and drew a lot of appreciation. During their visit in Sci-Tech Ateret Rachel in Bnei-Brak, the delegation members met with Haredi (orthodox religious) girls who study engineering and architecture. Later on, the delegation visited OpenValley – an innovative compound located in the heart of Caesarea’s Industrial Park. The Israel Sci-Tech Network cooperates with this initiative, in a partnership aiming to promote entrepreneurship among the network’s students. This is an inspiring coworking space for entrepreneurs, high-tech companies and innovation leaders, which puts Sci-Tech students right at the heart of the action, and introduces them to various entrepreneurship mentors. The delegation also visited Sci-Tech Naomi Shemer Gan-Yavne, where they met students involved in the Air Force Cadets programme, and heard about other projects taking place within the school, such as Field Training Leadership, a school-produced radio programme, and an Environmental Studies programme. The Friends of Israel Sci-Tech Network visited the Sci-Tech Tel Nof Air Force High School, and were impressed with the training of vocational students towards prospective employment in the aviation industry of the 21st century.